This is the documentation of the old Physics behavior. Read the new documentation here! I would rather see the Physics behavior examples! Please take me there now. The “Physics” behavior allows objects to behave according to the laws of physics. Physics behavior applies real world physics to your game objects. Game objects can move, fall, roll, bounce and collide. Check this box if you want the physics engine to try to do perfect collision handling on this object. This is best used for fast moving objects, i.e. Bullets, hence the name! “Consider as Bullet” is quite resource intensive. Use it on as few objects as possible. A “Dynamic Object” will be effected by the simulation of the physics engine. Gravity, forces, and all of the properties listed are a part of the physics engine. Think of a rolling ball in a pinball game, you would set this to dynamic due to its rolling movement. If you do not choose “Dynamic Object”, then you will create a Static or Kinematic object. These objects are not effected by the physics engine. They will not move on their own. They can be moved by your events and actions (Kinematic). Otherwise, they will just stay where they are (Static). In a pinball game you might use this for the flippers (Kinematic) and the walls and bumpers (Static). This setting prevents the object from rotating. It ignores the angular damping value. 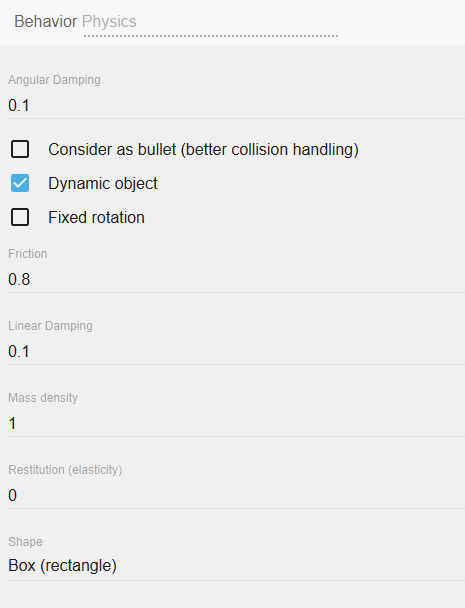 Angular damping controls object rotation speed. Friction is used to make objects slide along each other realistically. The friction parameter is usually set between 0 and 1, but can be any non-negative value. A friction value of 0 turns off friction and a value of 1 makes the friction strong. The Mass (weight) you assign to an object will greatly effect the physics of your game. Begin with all objects set to 1 and then adjust the value as you see fit. Restitution is used to make objects bounce. The restitution value is usually set to be between 0 and 1. Consider dropping a ball on a table. A value of zero means the ball won't bounce. This is called an inelastic collision. A value of one means the ball's velocity will be exactly reflected. This is called a perfectly elastic collision.